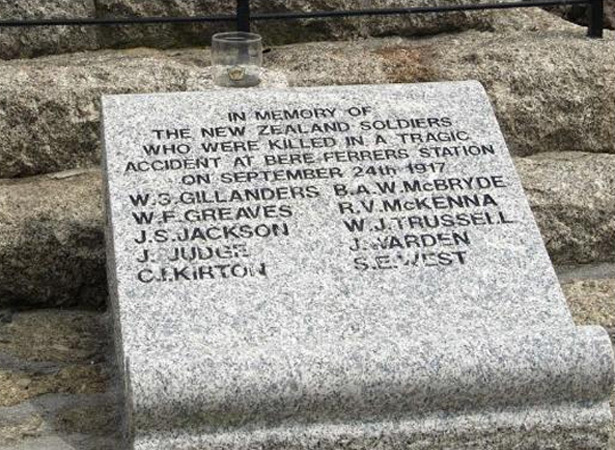 Ten New Zealand soldiers were killed when they were hit by a train at Bere Ferrers in southern England. The accident occurred as troops from the 28th Reinforcements for the NZ Expeditionary Force were being transported from Plymouth to Sling Camp on Salisbury Plain. These men had just arrived in Britain on the troopships Ulimaroa and Norman, and were heading to the NZEF base to complete their training. The train carrying the New Zealanders had left Plymouth Friary Station at 3 p.m. Prior to departure the men on board were informed that rations would be served at the train’s first stop in Exeter. Orders were given for two men from each carriage to collect provisions from the guard’s van when the train stopped. At 3.52 p.m. the train made an unscheduled stop at Bere Ferrers in response to a signal. As the rear carriages stopped outside the station those on board assumed they had reached Exeter. Eager to find food and ignoring the ‘two from each carriage’ instruction, many of the men jumped off, some onto the opposite track. Moments later they were struck by an oncoming train. We never thought of express travelling at 40 miles per hour. They don’t travel at that rate in New Zealand. It was a wonder more of us were not killed. I saw the coat-tails of the man in front of me fly up, and I picked his body up afterwards some yards down the line. The dead soldiers – William Gillanders, William Greaves, John Jackson, Joseph Judge, Chudleigh Kirton, Baron McBryde, Richard McKenna, William Trussell, John Warden and Sidney West – were buried at Efford Cemetery in Plymouth. An inquest held shortly after the accident concluded that the men had left the train on the wrong side because they assumed that the door through which they had boarded the train was also the exit. A verdict of accidental death was recorded. A year after the tragedy a memorial to the victims was unveiled at St Andrew’s Church in Bere Ferrers. A plaque bearing the names of the dead men was also erected at the railway station. In 2001 New Zealand’s National Army Museum helped arrange a remembrance service in Bere Ferrers, during which a new memorial was unveiled in the centre of the village. We have 19 biographies, 40 articles, related to Bere Ferrers rail accident.